In an earlier article about Elbow Dysplasia in dogs, orthopaedic expert Rob Rayward helped us to understand the ‘normal’ elbow joint. Here he looks into elbow dysplasia in dogs; a common cause of lameness in growing dogs. These conditions may be related to a poor fit between the three bones that make up the elbow joint. This poor fit or ‘incongruity’ can be seen on X rays or by CT (computerised tomography or CAT scan) examination. In some patients it may be difficult to identify because it is only present when the dog does certain activities, and sometimes this poor fit may have been present briefly during the dog’s development and is no longer present when investigations are performed. These primary problems tend to develop when the puppy is only a few months of age and will commonly affect both elbow joints. Once a primary problem has started, secondary change soon follows. Secondary change takes the form of abnormal joint wear and arthritis. These secondary changes may have consequences for the rest of the dog’s life. Are certain breeds prone to getting Elbow Dysplasia? Elbow Dysplasia is a significant problem in many breeds worldwide. It is recognised in numerous breeds although large breeds seem to be most affected – particularly Labrador Retrievers, Newfoundlands, Golden Retrievers, Boxers, Rottweilers and German Shepherd Dogs. As investigation methods have improved we are increasingly recognising it in smaller breeds too. Why do dogs get Elbow Dysplasia? Elbow Dysplasia is a multifactorial disease which means that a number of factors influence its occurrence. Genetics plays an important role although the precise genetic basis of Elbow Dysplasia remains undetermined. Other factors that are thought to influence the disease include growth rate, diet and level of activity. How do I know if my pet has Elbow Dysplasia? 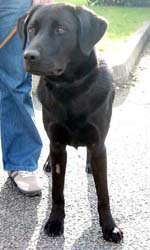 Not all dogs with Elbow Dysplasia will show obvious clinical signs of lameness. This may be because the condition is mild or because similar changes exist in both elbows which may mask the lameness. Clinically affected dogs with Elbow Dysplasia commonly show stiffness or lameness between 5 and 12 months of age. Typically owners describe that their dog is stiff after rest and after exercise but improves with light activity. Others will observe that their dog’s front feet begin to turn out. It is thought that this is an adaptation to elbow pain and is the dog’s way of relieving it. What tests may be required? Clinical examination may determine that the elbow joint is painful or swollen, although initially the lameness may be difficult to localise to a particular joint. Confirmation of the diagnosis of Elbow Dysplasia is made by performing further investigations which would typically be X rays or CT examination. X rays will often be able to determine whether your dog has elbow dysplasia either by identifying the primary problem or the osteoarthritis that occurs as a result. 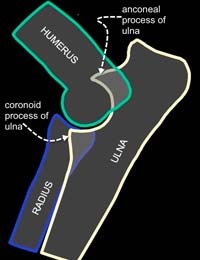 Three bones (humerus, radius and ulna) combine to form the elbow joint and these overlap on radiographs. This makes identification of the primary lesion problematic in some cases. CT examination is an excellent method of looking at the detailed structure of the joint and determining the precise nature of Elbow Dysplasia. It provides additional information to radiography and this can be useful when planning surgical treatments, especially in more complex cases.